Director of the Ho Chi Minh City Department of Construction Tran Trong Tuan said local residents and immigrant workers could buy apartments with prices from VND 300 million in District 12 and Nha Be District. At a recent press meeting, Mr Tuan said Ho Chi Minh City’s authorities plan to build apartments with prices at under VND 1 billion (US$43,898) per unit for employees located in the city. Reportedly, Ho Chi Minh City will study and work with investors to reduce costs and diversify products to build affordable apartments at prices from VND 300 million to VND 400 million and under VND 1 billion per unit to meet demand of the low-income earners in District 12 and Nha Be District. 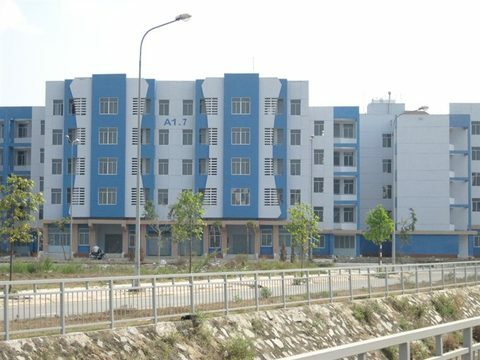 According to Mr Tuan, the plan was proposed after HCM City had successfully built 40,000 apartments with price at VND 100 million, similar to the southern province of Binh Duong that has built such apartments for local workers. A housing developer will build a social housing project of 1,000 units in District 12, while another one intends to develop social housing on a land site managed by the State. Mr Tuan said the city’s Department of Construction has discussed with these two investors to reduce the asking price to VND 300-400 million per unit. Specially, only projects that are developed on land under State management can offer homes at VND 300 million. If companies themselves conduct site clearance and compensation for site clearance, there would be no cheap apartments, he added. Moreover, Ho Chi Minh City has had 57 social housing projects with total area of 165 hectares, said Phan Truong Son, Head of the department’s Housing Development and Real Estate Market Division. Ho Chi Minh City Department of Construction has submitted to the city People’s Committee a social housing development plan until 2020, including solutions to diversify property products for people living along canals and rivers who are not eligible to buy commercial housing.